Dr. David Perrin has generously donated to the Department of Applied Medicine and Rehabilitation by funding an ongoing scholarship for one graduate student a year in order to support outstanding applicants. 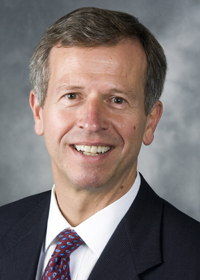 David H. Perrin is Provost and Vice Chancellor for Academic Affairs, and Professor in the Department of Kinesiology at the University of North Carolina at Greensboro. He received his BS from Castleton State College, MA from Indiana State University, and PhD from the University of Pittsburgh. Perrin was editor-in-chief of the Journal of Athletic Training for eight years (1996-2004) and was founding editor of the Journal of Sport Rehabilitation. He is author of Isokinetic Exercise and Assessment and Athletic Taping and Bracing, editor of The Injured Athlete, Third Edition, and coauthor of Examination of Musculoskeletal Injuries and Research Methods in Athletic Training. He is also editor of the 5-textbook Athletic Training Education Series. From 1979 to 1986, he served as undergraduate program director of the athletic training curriculum at the University of Pittsburgh. For 15 years (1986-2001) he directed the graduate programs in athletic training and sports medicine at the University of Virginia, where he founded the Sports Medicine and Athletic Training Research Laboratory in the Curry School of Education. His awards from the National Athletic Trainers' Association include the Sayers "Bud" Miller Distinguished Educator Award in 1996, the Most Distinguished Athletic Trainer award in 1998, the William G. Clancy, Jr., M.D. Medal for Distinguished Athletic Training Research in 1999, and the Hall of Fame in 2003. He was the recipient of a University of Virginia All-University Outstanding Teaching Award in 1997 and in 1998 received the Curry School of Education Foundation's Outstanding Professor Award. Perrin is a certified member of the National Athletic Trainers' Association and is a Fellow of the American College of Sports Medicine and the American Academy of Kinesiology and Physical Education.